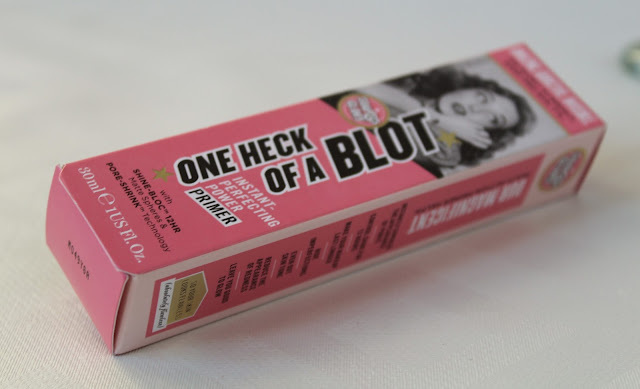 There is a lot of hype going around right now about Soap and Glory, especially their One Heck of a Blot Primer. The Soap and Glory brand is a great brand that I think deserves a lot more attention than it gets, especially for their makeup, which is of brilliant quality and is affordable. One Heck of a Blot originally started out as a pressed powder that was used for touching up throughout the day. 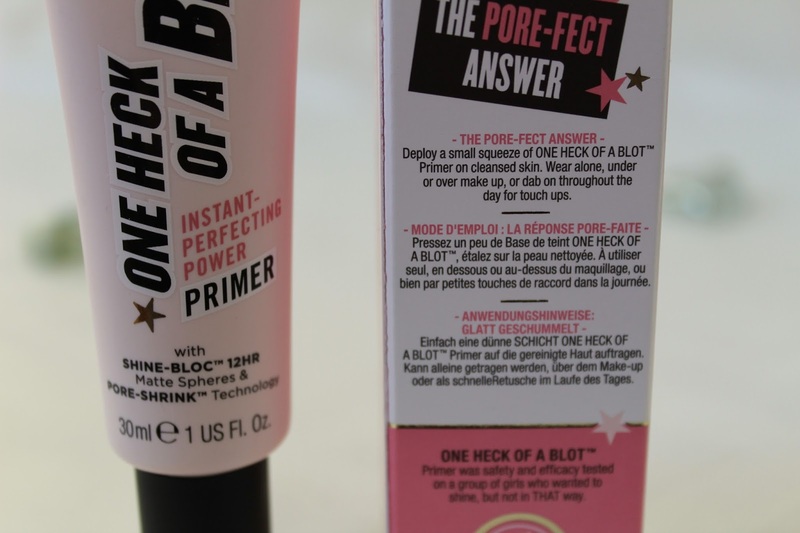 Soap and Glory have now expanded their range and have included a new foundation and a new primer, as you can tell I will be reviewing the primer today. I have never desperately needed a primer but I had been so interested in them. It took a lot of trying out numerous primers to find this little gem. The winter months call for a good primer too. So, as the name suggests, this range of products is specifically designed for individuals who have more of an oily skin type and would have to 'blot' during the day to control excess oil. This primer claims to give you 12 hours of oil control for a more matte complexion, shrink the appearance of pores and even skintone and redness. I have honestly never been so blown away by a drugstore primer, so I was a little sceptical when I was first trying this out. I have to say that this has been my favourite one that I have tried so far! 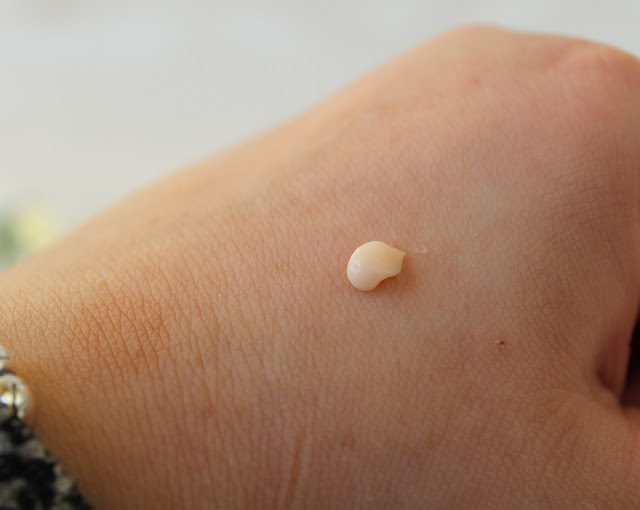 It has a cream-like formula and it doesn't do that annoying that where it balls up on your face. My base goes on really well when I use this and it helps to keep my face shine free all day long. I have tried this with different foundations, my Bourjois Healthy Mix, Too Faced Born This Way and also, Maybelline Dream Velvet and everytime it help up. I always use a powder on top of my foundation to set it in place so I have never tried out the primer with just a foundation alone. I also believe that it has definitely increased the wear-time of my makeup, especially during days where i'm at uni and busy running around. The One Heck of a Blot primer has vitamin E which gives hydration whilst the Pore-Shrink and Pore-Bloc technology helps combat pores and shine. It's also fragrance-free which is good for those with sensitive skin and not too good with strong smells. It helps to hide imperfections, even out your skin tone and also makes your makeup last longer. It also instantly absorbs oil and controls shine all day long. Considering it claims to 'shrink the appearance of pores', this is something I did not see a difference with. To be honest, it did not make a real differene to how my pores looked at all. My skin did feel smoothed out and soft but did not perfectly even out the skin in any way. I did notice that I had a more matte appearance to the skin and definitely took away any shine that I might have had. Overall, I love this primer. I would recommend it for anyone who wants a primer that helps their makeup stay in place throughout the day. For £10 you get 30ml, which is really good. You can pick this up from Boots. 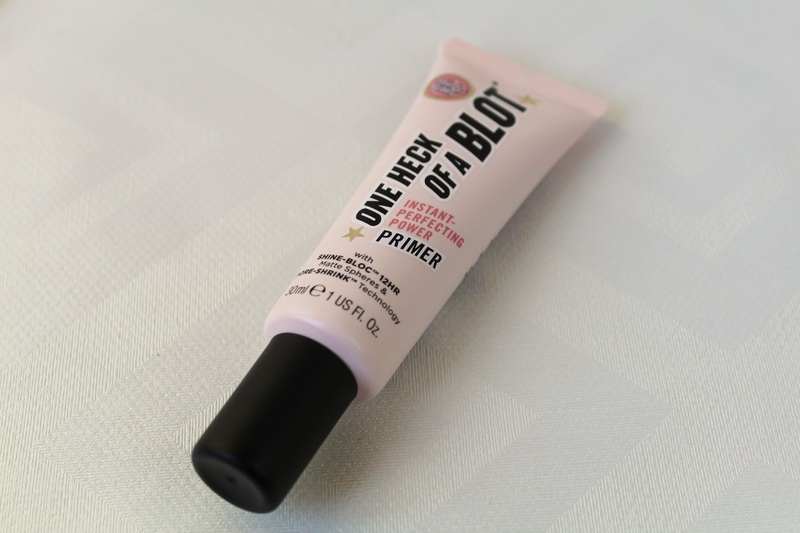 Have you tried this primer, do you like it? What drugstore primers do you recommend?